1 of 5 Heat oven to 375 degrees. In a bowl, combine bread crumbs, 1/3 cup of the buttermilk and the egg. Let soak 5 minutes. 2 of 5 In large bowl, combine meatloaf mix, crumbled sausage, onion, Worcestershire, oregano, 1/2 tsp of the garlic salt and 1/2 tsp of the pepper. Gently stir in bread crumb mixture. Fit meat mixture into a 9 x 5 x 3-inch loaf pan and smooth top. 3 of 5 Bake at 375 degrees for 1 hour or until meatloaf is 150 degrees. Let rest, covered, 10 minutes. 4 of 5 Meanwhile, place potatoes in a large pot and add enough cold water to cover by an inch. Salt water and bring to a boil over high heat. Cook 12 minutes or until tender. Drain and return to pot. Add remaining 1 cup buttermilk, the butter, remaining 1 tsp garlic salt and remaining 1/2 tsp pepper. Mash to desired consistency. 5 of 5 Prepare gravy mix following package directions. 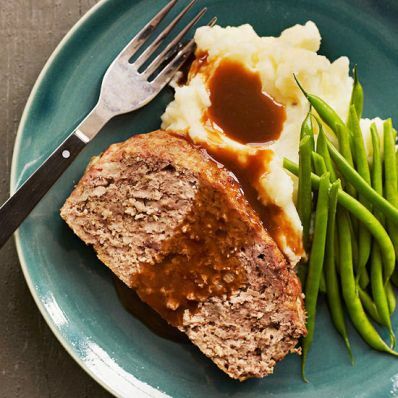 Remove meatloaf from pan, discarding drippings. Slice and serve with mashed potatoes and gravy.